There are moments when something deep within me drives me to do unexpected things at unexpected times, and I have no other option than to follow that feeling. I knew I had to go. Whatever it was that was biting at me, that was pulling on my heart strings - it said GO! The random occurrences - that I can only explain as coincidences - were undeniable signs telling me, This is what you are meant to do. I’ll never forget my buddy Paul telling me this on Maui - and the feeling of time stopping. Everything around me stood still, and my mind flashed to that one beach just north of Jedidiah Smith Redwoods State Park in Northern California, where the small, clean waves, I remembered thinking, would be perfect for hosting my free surfing retreats. I knew without a doubt. YES! I will do that! With Paul’s help I began making connections and reaching out to folks in the Crescent City community, and by spring I met with Pyuwa, the Tolowa Dee-ni’ Nation's Culture Department Director, and Cynthia, a Tolowa Language Teacher, in a welcoming home that served as the Tribe's Culture Department, near the Smith River. Do you know much about Tolowa Dee-ni’? Pyuwa asked me after we shook hands and made our formal introductions. Honestly, I knew only what I could deduce from the resources in the area. A glow of embarrassment. We are descendents of the survivors of a holocaust on our homelands -- a genocide that took most of our people’s lives. Pyuwa and Cynthia began telling me the story of the Tolowa. It took all the strength within me not to break into sobbing fits. This was a meeting to discuss the idea of hosting a surfing clinic for their community. Suddenly, I could care less about surfing. But, that was the purpose of the meeting, and so, after learning the history of the Tolowa People, and how they were able to preserve their culture, we discussed ways that surfing could be beneficial for the girls and women in their community. Sure enough, we set a date, shook hands and said, See you in August for the Crescent City Surfer Girls Retreat! As my partner, Hans, and I drove south from Port Angeles, Washington in August, his big green sprinter van packed to the gills with event-hosting equipment and supplies, we took our last breaths of fresh air before entering fire country. Oregon and California were experiencing historically destructive wild fires, whose dense smoke filled every nook and cranny as far as the eye could see. The number one priority fire in the country, the Chetco Bar Fire, was burning Tolowa ancestral lands on the border of Oregon and California, consuming nearly 200,000 acres -- and I arrived into Crescent City to host a surfing retreat. After hearing the news of the fire, I began to wonder if I should cancel -- the priority being the safety of their people, and the protection of their land -- surfing retreats could wait. Volunteers flew, and others drove for days just to help out with the retreat. A Tolowa woman my age, Amanda, heard about the retreat and reached out to offer her support with whatever I needed help with. She turned out to be the crucial component for the event's success, and the relief to my stress: filling sign ups within a week, requesting and gaining approval from the Tolowa Tribe to donate food for the event, and helping find camping accommodations for me and my volunteers. Amanda taught me the true meaning of giving back. Volunteers Jennie and Alyssa putting the goodie bags together. My partner Hans fashioned some stakes out of applewood to secure the tents. The day arrived, and I was buzzing with so much excitement the night before that I hardly slept. But I didn't feel fatigued -- I was ready. We headed to South Beach from our private campgrounds that a lovely family of the Elk Valley Rancheria offered to let us stay at. Within minutes we were at the event site, and me and my team of volunteers set up the equipment and decorations. Shirin and Tom Tyrell, owners of Local Boys Surf and Skate Shop in Crescent City, California provided wetsuits, surfboards, and rounded up nearly 15 volunteers to help with the event. Their hearts are huge, and generous, and they look forward to creating a surf club for the Crescent City community in the near future. Before the participants arrived, we had a volunteer surf instructor meeting to go over safety protocol and instructor pointers. 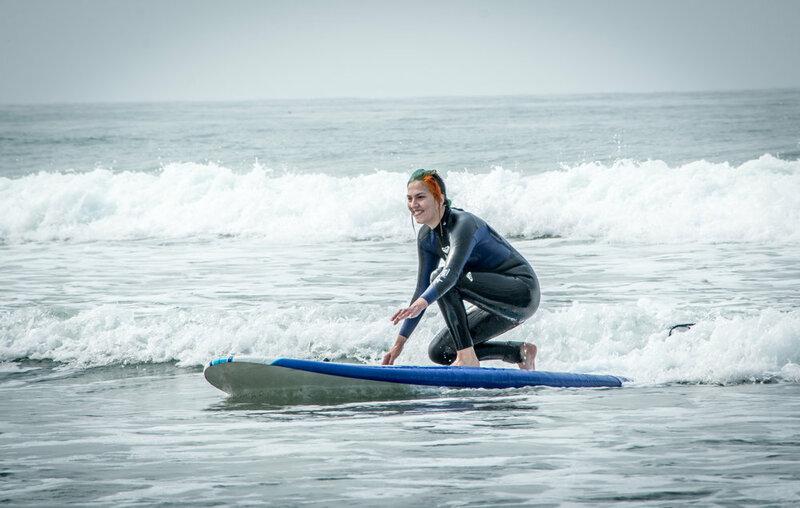 The volunteers are what made the Crescent City Surfer Girls Retreat! It was relieving to know that our participants were safe in the water with so many experienced surfers keeping an eye on everyone. It also gave me the opportunity to watch the girls surfing in to me on the shoreline, so I could offer them progressive tips, and help them get turned around to head out for another wave. Biggest Thank You to all the volunteers who offered their support that day! Once the girls checked in and suited up, we put our ocean warrior faces on. And took some pre-surf-glow photos. The Crescent City Surfer Girls came with so much positive, powerful energy. They were confident, full of joy, and super excited to learn how to surf! Momma, Desh, was all smiles at the retreat, and her family supported her every step of the way. What I love so much about the free surfing retreats I host, is the awesome support from the lady's loved ones. They are just as much a part of the magic of the day: taking care of little ones, and hooting it up for their women while they're surfing. Then we circled up by the ocean for an opening ceremony and introduction game. Tolowa woman, Suntayea, sang a prayer at opening circle. Then the abalone shell was passed around the circle with the burning sacred root. After ceremony, we played a fun game that I learned from my Brown Girl Surf community in Oakland, CA, to introduce and get to know each other. This game reflected our personal human expression through body movement, where you say your name and make a movement at the same time, then the whole circle repeats the name and movement together. It always gets a good laugh. These Crescent City Surfer Girls were most expressive! I was feeling rather Hoppy! Volunteer, Auntie Jenny, showed the girls how to move! Once we introduced ourselves, we went to the surfboard circle and talked about ocean safety, navigation, and awareness, as well as the technique to the feet, which I call Surf Yoga. Then we practiced together on land. Looking good ladies! Now let's go translate it in the ocean! Tolowa girl, Tsinte', caught the first wave of the day, and stood up the first wave of the day! Den'e showed exemplary surfing style, with big smiles and relaxed finger language. Graceful Warrior Girl, Allie, looking smooth. Cadence, all smiles, and styles. Deja Ripping and Loving every second! "I learned I'm more connected to the ocean than I thought!" "I learned that I am powerful!" The moms whose daughters were participating stood by the water's edge to watch their girls surfing, and took photos with their phones. I could hear the moms giggling and could see the pride in their faces. I overheard one of the mothers saying, "I feel like this is the first time I've laughed since the fires started. I feel like I can breathe again." I was so proud of all the Aunties who came out to experience the glide! I could tell they enjoyed every second of their time in the water, with all their faces full of surf glow. Every single girl and woman who participated in the event inspired me in so many ways. I will always remember their fervor, determination, positivity, humor and grace! What a great community of surfing women! "No one has ever done anything like this for our indigenous girls. We would love if you could come back to do this again..."
Special thanks to these volunteers for their support leading up to the event, during, and after. There truly are no words that could ever express the gratitude I have in my heart for you all, and the spirit you each possess. I love you so very much! 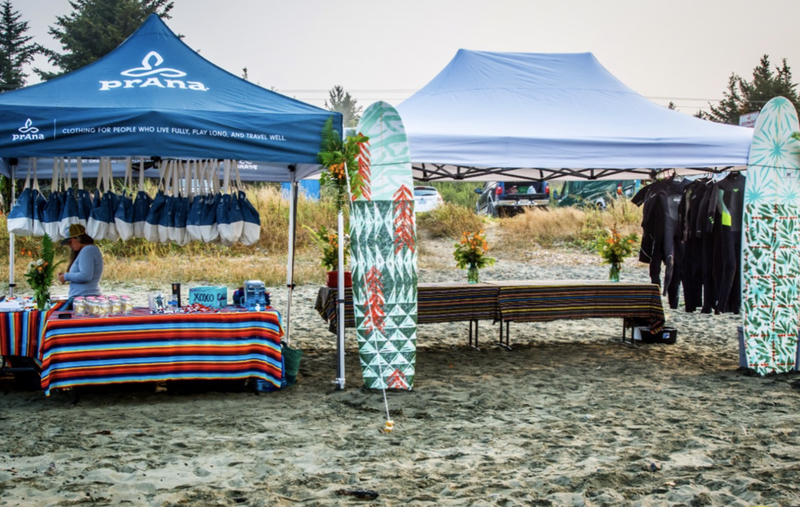 Big Mahalo to PrAna, the main sponsor for the Crescent City Surfer Girls Retreat, for the awesome giveaways, and help getting me to this remote group of women! With your support, I can give back to truly deserving communities!